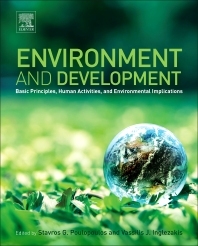 Environment and Development: Basic Principles, Human Activities, and Environmental Implications focuses on the adverse impact that human activities, developments, and economic growth have on both natural and inhabited environments. The book presents the associated problems, along with solutions that can be used to achieve a harmonic, sustainable development that provides for the co-existence of man and natural life. Chapters provide detailed information on a range of environments including: atmospheric, aquatic, soil, natural, urban, energy, and extraterrestrial, as well as the relationship between the environment and development. In addition, this comprehensive book presents the latest research findings and trends in global environmental policy for each issue. The book suits students in all engineering disciplines (particularly chemical, mechanical, and environmental engineering), environmental science and technology professionals (including ecologists, environmentalists, and professional engineers dealing with environmental issues), and policy makers and government officials. Dr. Stavros G. Poulopoulos has studied Chemical Engineering at the National Technical University of Athens (Greece). He holds M.Sc. in Process Analysis and Plant Design and a second M.Sc. in the interdisciplinary field of Environment and Development. He conducted his Ph.D. research in the field of environmental protection. Specifically, his Thesis was entitled “Catalytic Oxidation of Oxygenated Organic Compounds in Exhaust Emissions”. Subsequently, he conducted post-doc research for three years on the development of combined biological and chemical methods for the treatment of highly toxic wastewaters. He has conducted research for over 15 years on the treatment of gaseous emissions and toxic wastewaters. His work as an author includes more than 70 publications in the fields of Chemical Engineering and Environmental Science & Technology, which resulted in more than 700 citations. Moreover, he has co-authored one book on Adsorption, Ion Exchange and Catalysis (Elsevier) and has published also a chapter on the Gaseous Emissions and Pollution Prevention from the Incineration of Sewage Sludge (Nova). He has been acting as a reviewer for 22 international scientific journals. Besides his academic activities, he has offered his services as environmental specialist at the Hellenic Ministry of Infrastructure, Transport and Networks since 2007 and has cooperated with various companies. He has been working as an Associate Professor at the School of Chemical Engineering of Kazakh-British Technical University since 2013, teaching courses at the core of chemical engineering such as Chemical Reaction Engineering, Momentum Transfer, Heat & Mass Transfer, Plant and Processes Design, Chemical Engineering Lab., and Design of Chemical Utilities, at the undergraduate and master level. He is the editor along with Dr. Inglezakis of a new book entitled “Environment and Development. Basic Principles, Human Activities, and Environmental Implications.” published by Elsevier in May 2016. The publication of this book has been a dream to come true for Dr. Poulopoulos. Dr. Vassilis J. Inglezakis is Chemical Engineer graduated from the National Technical University of Athens (Greece) in 1996. He got his PhD degree on Chemical Engineering in the field of Pollution Abatement Technologies in 2002 and continued as post doc researcher on Environmental Science & Technology. Currently he is an Associate Professor at a new university in Central Asia with the responsibility of building a team of professors/students and top-notch research labs focused on Chemical Engineering and Environmental Science & Technology. He has more than 150 publications in the fields of Chemical Engineering and Environmental Science & Technology, his publications have received more than 1,450 citations and his Scopus h-index is 23. Dr. Inglezakis has a strong professional experience in environmental sector acquired by either leading or participating as expert in numerous international projects cooperating with private companies, public institutions and other stakeholders from local, regional and national level authorities in more than 15 countries. He has a consolidate experience in top-management positions as he has been Pre-Accession and Resident Advisor (Team Leader) in Slovakia (2004-2005) and Romania (2006-2007), in both countries for preparing the grounds for their European Union accession in the framework of European Union projects. Dr. Inglezakis has been TAIEX expert (institutional building, European Commission), project proposals evaluator for the European Commission (Erasmus Mundus, LIFE+ and ERANEMED programmes), the Executive Agency for Higher Education, Research, Development and Innovation Funding (Romania), Russian Science Foundation and the National Center of Science and Technology Evaluation (Kazakhstan).